A view of the island known as "Stromboli." A plume rises from the volcanic vent with the same name. The island has a population of a few hundred people. This view shows the northeast side of the island where most of their dwellings are located. Image copyright iStockphoto / miralex. Stromboli is one of the most active volcanoes on Earth and has been erupting almost continuously since 1932. Because it has been active for much of the last 2,000 years and its eruptions are visible for long distances at night, it is known as the "Lighthouse of the Mediterranean". It is among the world's most visited volcanoes. Stromboli is widely known for its spectacular eruptions which jet fountains of molten rock from its lava-filled central crater. Because these eruptions are so distinctive and well known, geologists use the word "Strombolian" to clearly describe similar eruptive activity at other volcanoes. Stromboli forms the northeastern-most of the Aeolian islands. Its base begins over 1000 meters below the surface of the Tyrrhenian Sea and it rises to an elevation of 924 meters above sea level. Map showing the location of Stromboli, in the Tyrrhenian Sea. Map by Geology.com and MapResources. Nearby Volcanoes: Etna, Vesuvius. Simplified plate tectonics cross-section showing how Stromboli is located above a subduction zone formed where the Eurasian and African plates collide. Like Mount Etna on the island of Sicily, Stromboli is a part of the Calabrian volcanic arc. The volcanoes of the Calabrian arc are associated with the subduction of the African tectonic plate under the Eurasian plate. Stromboli is located on a NE-SW trending fault system, but the mechanisms which feed the volcano's magma chamber, and their relationship to the fault system, are poorly understood. Stromboli venting steam. Stromboli is a stratovolcano that begins at the bottom of the Tyrrhenian Sea and rises to an elevation of 924 meters (3031 feet) above sea level. This is a view of the eastern side of the island and the Sciara del Fuoco (Stream of Fire) collapse scar, which funnels tephra and lava flows to the sea. Image copyright iStockphoto / ToolX. The island of Stromboli was built by a series of eruptions of potassium-rich basalt and basaltic andesite lavas. The first eruptions began about 200,000 years ago, and formed the now-eroded Strombolicchio volcano. 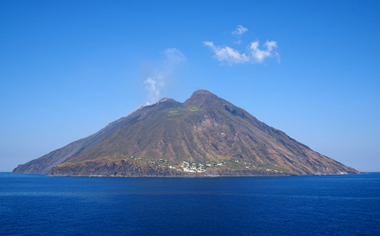 Starting around 160,000 years ago, the island of Stromboli proper began forming. For the next 150,000 years, lava flows and pyroclastic deposits built a stratovolcano, which was eventually covered by pyroclastic deposits, lahars and lava flows. The Neostromboli period saw the formation of the modern volcanic edifice, which involved numerous flank and summit caldera collapses. The current eruptive vents are located at the top of the Sciara del Fuoco (Stream of Fire), a large collapse scar on the northwest side of the island which formed about 5,000 years ago. Stromboli is the type location for the "Strombolian" style of eruptions. Strombolian eruptions are mild explosive events where "slugs" of gas periodically rise through a magma-filled volcanic conduit, burst at the surface, and throw bits of lava into the air. The lava falls as bombs (larger than about 3 inches in size) and scoria (smaller fragments), and eventually builds into a steep-sided volcanic cone. 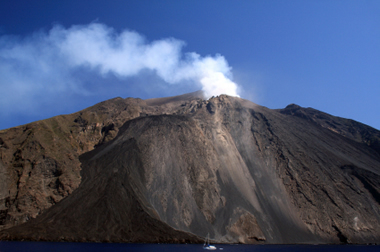 The Sciara del Fuoco poses the most serious volcanic hazard on Stromboli. A catastrophic sector collapse would not only displace large volumes of material and possibly expose dike systems on the volcano's NW slope; it could also create a tsunami, which could cause much damage if it reached any of the other islands in the Aeolian archipelago or the Sicilian coast. View of Stromboli erupting at sunset, jetting basaltic magma high in the air to form an incandescent "fountain." This is the type of eruption known as "Strombolian." Image copyright iStockphoto / lucamanieri. Activity at Stromboli has been recorded by historians for more than 1,000 years, and varies from mild degassing to lava flows to violent explosive eruptions. Records from 1907 indicate that one explosion was strong enough to shatter windows in the island's villages, and strong explosions in 1930 were associated with an earthquake that also created a small tsunami. The most recent eruption began in 1932, and has continued essentially uninterrupted since then. Periodically, Stromboli's eruptive style transitions and vents near the summit produce lava flows that are funneled by the Sciara del Fuoco to the sea; the most recent of these occurred in 2002 and 2007. One theory that has been suggested to explain the transition is that the magma in Stromboli's summit conduit occasionally forces open dikes on the NW flank, and is erupted as lava flows rather than through gas-driven explosions. 'Come si noma questa isola?' - 'What is the name of this island?' 'Stromboli,' replied the rickety little shepherd, dashing away from Hans and disappearing into the olive groves. We thought little enough about him. "Stromboli! What effect on the imagination did these few words produce! We were in the center of the Mediterranean, amidst the eastern archipelago of mythological memory, in the ancient Strongylos, where Aeolus kept the wind and the tempest chained up. And those blue mountains, which rose toward the rising of the sun, were the mountains of Calabria." Smithsonian Institution Global Volcanism Program Website: Stromboli page. 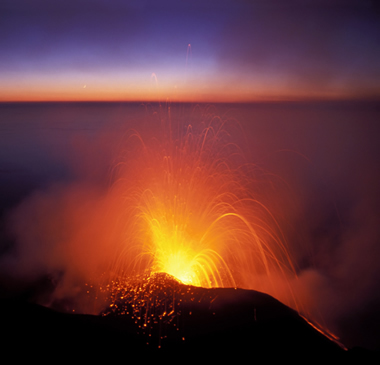 Italy's Volcanoes: The Cradle of Volcanology: Stromboli Volcano. Mattia et al., 2008, Geophysical investigations of the plumbing system of Stromboli volcano (Aeolian Islands, Italy). Journal of Volcanology and Geophysical Research, v. 176, n. 4, p. 529-540. Verne, Jules, 1864, Journey to the Center of the Earth (Voyage au Centre de la Terre).